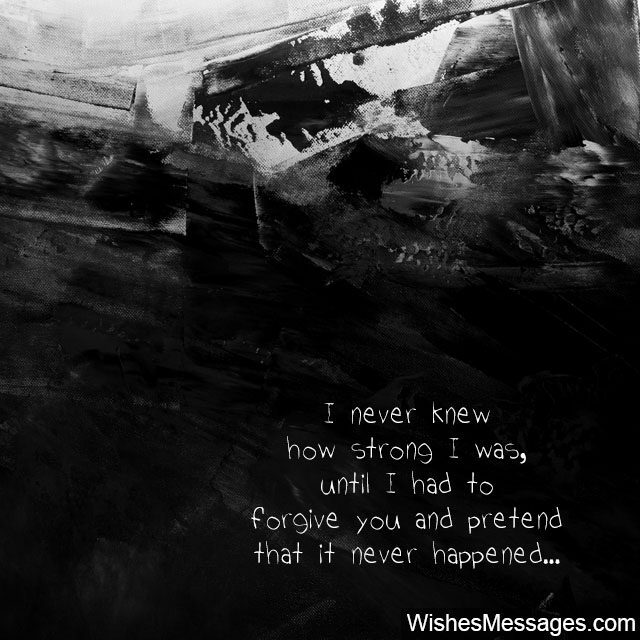 I Forgive You Quotes for Her: Forgiveness takes a lot of strength and courage. Yes we’ve all read inspirational quotes about forgiving people, but if only life was that easy! Whether it is a girlfriend, boyfriend, husband, wife or an ex – knowing whether to forgive someone essentially comes down to the relationship and deciding what role you see them playing in your life. If you truly want to let go and move on, all you have to do is find the right words and make peace with the past. Moving on and letting go are the center pieces of the whole forgiveness juggernaut. Never confuse the need to forgive someone with weakness. When you forgive, you’re acknowledging the past and simply being mature enough to take a step towards a better future. 2) Relationships survive when because mistakes are forgiven, not punished. 3) To be free, you must let go. To love, you must forgive. 4) All this time, I somehow blamed myself for how you behaved. Maybe I couldn’t get myself to believe that it wasn’t me who was causing the problems… it was you all along. Love made my blind to the fact that you were taking advantage of my naivety. Today, I find the courage to walk away. I’m finding the strength to realize that it was not my fault that you cheated on me. Despite all that you’ve done, I respect the love I had for you, and always will. It’s a part of me that I’ll never want to erase. I wish you well, but I must move on. I forgive you. 5) I’m choosing the future over the past. I forgive you. 6) I believe in second chances. I believe in letting go. But most importantly, I believe in us… I forgive you. 7) Strange, life is… the more you break my heart, the more I want to be with you. And again, I forgive you. 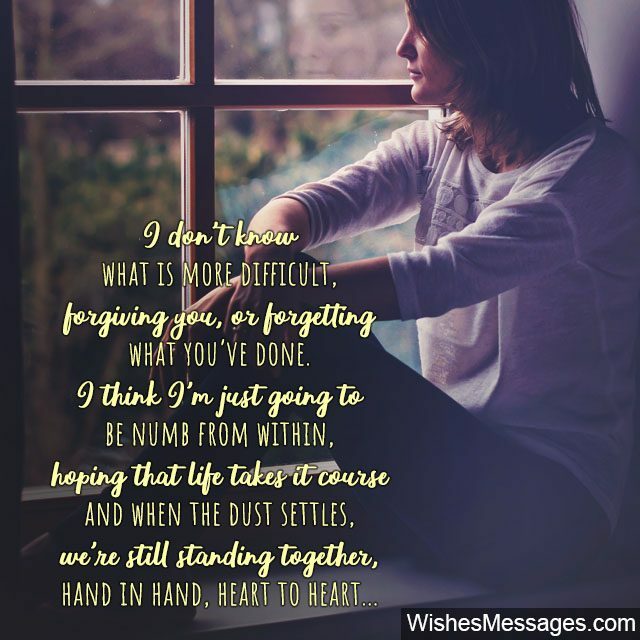 8) I don’t know what is more difficult, forgiving you or forgetting what you’ve done… I think I’m just going to be numb from within, hoping that life takes it course and when the dust settles, we’re still standing together arm in arm. I love you baby. 9) No matter what, deep down inside I know that you love me and I love you… and nothing else matters. I forgive you. 10) Forgiveness is a conscious choice to let go of disappointment and embrace hope. I’m making it today, I forgive you. 11) Forgiveness may not heal the wounds, but it will stop them from getting deeper. 12) I’m not angry with you, I’m sad to see you become the person I never thought you’d be. 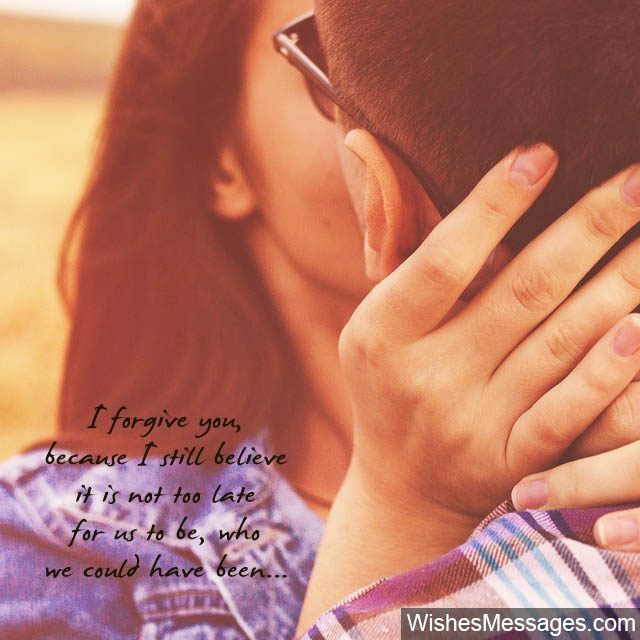 Maybe it’s time to move on… I forgive you. 13) Giving a second chance is better than regretting later that you didn’t. And with that thought, I forgive you, hoping that this second chance will heal the wounds. 14) I forgive you, not because I’m ok with what you did… but because letting hate ruin the memories would be an insult to all the sacrifices I’ve made to put a smile on your face. 15) I forgive you. Not for you, but for us. 16) If you’ve been brave enough to apologize, then I’m strong enough to forgive. 17) I’ve come to the conclusion that sooner or later, you’re going to have to accept the past for what it is… and the sooner, the better! 18) I forgive you, because I want to hold on to what we have, rather than remember it as what we had. 19) I’m not saying that what you’ve done is ok… I’m saying that I believe you, when you say that you’ll never do it again. I forgive you. 20) ‘Forgiveness doesn’t need to be absolute. Just because you’re willing to let go of the pain, doesn’t mean you’ve to be ok with what happened. 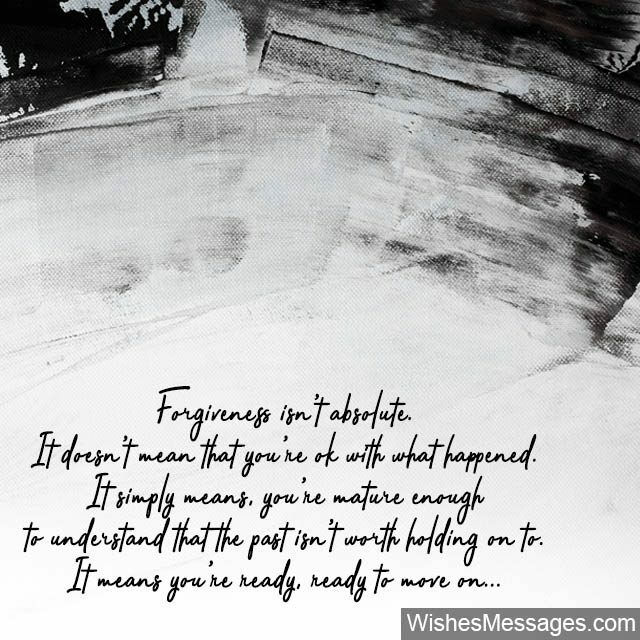 It simply means that you’re mature enough to put a stop to the bitterness…’ With these thoughts, I forgive you. But don’t confuse my maturity with weakness. 21) You were my girlfriend, and I’ll always treasure that. Life had different plans for us, but I’ll never let the memories fade away. I forgive you, but it’s time to move on. 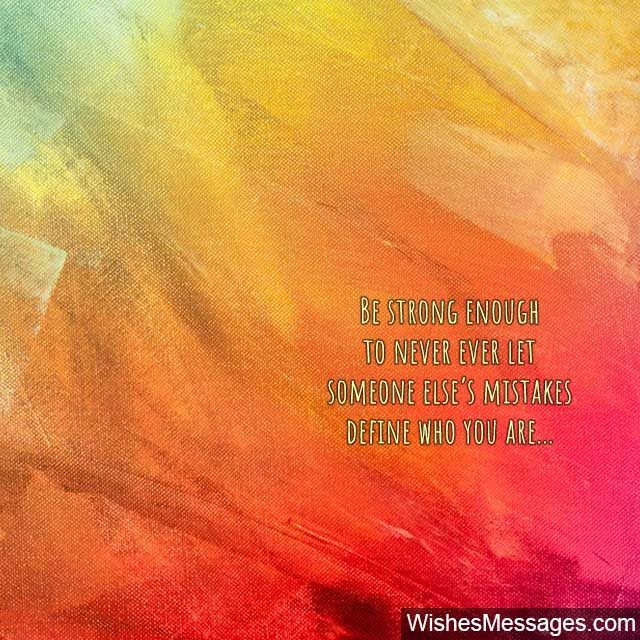 22) Be strong enough to not let someone else’s mistakes define who you are. Forgive and move on. 23) Every relationship has problems. In the end it comes down to how badly you want to see it through. I’m not going to let silly things break it apart. I forgive you. 24) I’ll never understand why you did, what you did. The truth is, I don’t even want to. All I want is for us to be the way we were… happy. I forgive you. 25) Because happiness is greater than hate, I forgive you. 26) Accept, forgive, let go and move on… that’s the only way, the pain goes away. 27) My forgiveness is not my weakness. It is my strength to see the greater good that lies in letting go of the past for the better of you, me and all things that really matter. 28) I forgive you, not because you deserve it, but because I deserve peace. 29) Forgiveness isn’t absolute. It doesn’t mean you’re ok with what’s been done to you. It simply means that you’re mature enough to understand that the past isn’t worth holding on to. It means you’re ready, ready to move on… that being said, I forgive you. 30) I will forever feel bad about what you did, but that doesn’t mean I’m going to hold it against you. I forgive you. 31) I forgive you, because love deserves a second chance. 32) Revenge and hate are for the weak. Forgiveness and love are for the strong. 33) Some people think that revenge and hate makes them stronger; and that couldn’t be further from the truth. Revenge and hate makes you bitter and weakens you from the core. The only way to free yourself from its chains is to realize that forgiveness is the only thing that’ll make you stronger… it frees you of the hurt and the pain that brings you down. It helps you to stop looking back, and start looking forward. 34) I’d rather forgive you and move on, than to continue living in the pain of the bitter memories. 35) Not a day goes by when I don’t think about what you’ve done. I don’t think I’ll ever be able to let go, but I want to start over again… I love you. 36) I forgive you, because I still believe it’s not too late for us to be who we could’ve been. I love you baby. 37) I’ve thought a lot about this and I’ve realized that unless I let go of past, unless I truly forgive you, I’ll never be able to move on. Whether I like it or not, that’s the truth of my life. 38) I forgive you, not because you deserve it but because I know there’s nothing I can do to change what has already happen. 39) My forgiveness is not absolute. Just because I’m willing to let go of the pain, doesn’t mean I’m ok with what happened. 40) I don’t expect you to change… all I want is peace of mind. I’ve given our relationship too much to see it crumble over things that don’t matter.